I make no secret of the fact that I live with a mental illness. My first episode of depression happened when I was twelve years old. I was going through a lot at the time including the death of my beloved grandad, and I really struggled to cope with all the strong emotions I was feeling. Talking therapies helped at the time and I have used them when I have relapsed since. I am currently in Cognitive Behavioural Therapy for my depression and generalised anxiety, something which I was diagnosed with more recently, after I had Benjamin, who is now two. I suffered antenatal and postnatal depression with all three children and it is something which plays a large part in our decision not to have any more children. I don’t write about mental illness that much as I do find it is such a personal thing for those who live with it, but I wanted to put together a post featuring five methods out there that can help to combat depression and generalised anxiety. As a disclaimer, I am not a qualified medical professional and am only able to recommend the following from personal experience. Please seek medical advice if you are struggling with your mental health. When my mental health took a turn for the worse in autumn last year, one of the things I felt really helped me to get through it was Rescue Remedy. I don’t know if it was a placebo effect or not but it provided a lot of comfort to me when I was feeling worked up and anxious and I carry a spray around with me in my handbag to use if I get anxious when I am out and about or feel like some reassurance before doing something a little daunting. I also use the bedtime spray version every night before I go to sleep. There are some brilliant products out available from supermarkets, chemists and online these days. 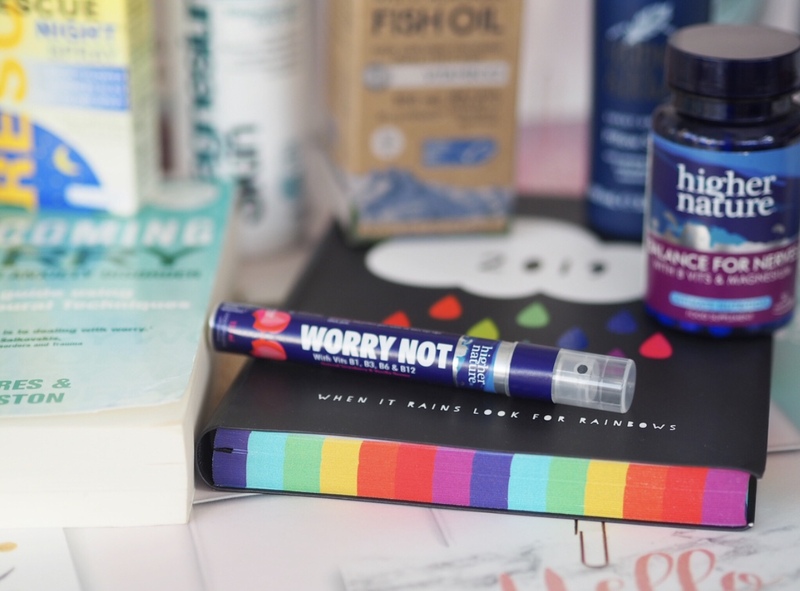 Higher Nature have a spray similar to rescue remedy, called Worry Not, which contains a variety of vitamins and is a natural strawberry and vanilla flavour. Their Balance for Nerves supplement is also good for regaining a feeling of control, made with botanicals, vitamins. amino acids and magnesium and suitable for use during the day or night. Wiley’s Finest Wild Alaskan Fish Oil Vitamin K2 supplement works go combat a deficiency to vitamin D, which has been linked to Seasonal Affective Disorder (SAD) and depression. I have been using Feather & Down’s Pillow Spray for almost a year now and, although strictly not a product aimed at those with a mental illness, I find it really helps to relax me before going to sleep, helping me to unwind and destress. I am a huge fan of the Better You range since they first sent me across some of their lotions for adults and children, which I have been using ever since. Magnesium is meant to be brilliant for combatting depression and regulating mood, and the extensive range available from Better You includes body lotions, gels, oils and body butters as well as the fantastic magnesium flakes foot and body soak for use in the bath. The range is purely natural and helps to relax and remineralise, with a lot of the products also suitable for use during pregnancy. As I have mentioned, I have had therapy several times during my life when depression has hit and I really find it helps me when I am feeling lost and a little out of control. Talking helps me, but I don’t feel I can necessarily burden loved ones with what I want to say. Although I know they will always be there for me, they have their own lives and troubles and I find it constructive to talk about issues with somebody impartial, who is able to advise without letting their own emotions get in the way. I have had both traditional counselling and Cognitive Behavioural Therapy, and I find both help in different ways. Counselling is a little less practical but allows you to talk freely and really get out what it is you want to say. CBT is a little more like being back at school in a way, where your therapist teaches you about what it is you are going through before working with you to overcome issues in a practical hands-on manner. I have homework and set reading to do between sessions, and I find it really interesting to understand the reasons behind how I think and feel. I am working specifically on my anxiety with my CBT currently, but depression and anxiety quite often go hand in hand and I feel the two overlap a bit. As part of my CBT, I have been advised to read the Overcoming Worry & Generalised Anxiety book, which is available on eBay and Amazon and is priced at around £10. It is really interesting and provides case studies and examples throughout, as well as practical exercises which you can do yourself. I have also picked up several other self-help style books in the past and have found some of them useful. I would suggest looking at reviews and researching the author to find out whether they have qualifications, or personal experience of mental illness themselves. I have recently been sent an advance copy of How to Come Alive Again, which was written by Beth McColl, who has suffered with depression and anxiety and used her own experiences to write the book. Medication for mental illness is still seen as a little taboo, despite a high percentage of people using prescribed medication to cope with anxiety, depression and a whole host of other mental illnesses which I am not going into as I don’t have personal experience of these. I am not ashamed to say that I am taking medication for my anxiety and depression. I went to speak to my doctor and made an informed decision before starting on the medication and it has helped me to feel strong enough to get through a tough time. There are also other options out there, including treatments such as Transcranial Magnetic Stimulation (TMS), which is available from Smart TMS, an innovative mental health clinic. The treatment is approved by NICE (The National Institute for Health & Care Excellence), is non-invasive and has high success rates for treating depression and other mental illnesses. I have been gifted some of the products featured, however all words and images are my own. As I mentioned earlier in the post, please do speak to a medical professional for advice.